To help you understand some of the OSHA regulations regarding your roof perimeter, we’ve provided answers to some of the questions we frequently get asked. 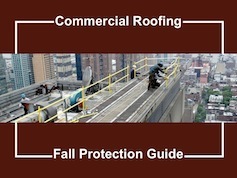 For OSHA’s full list of requirements, read through their Fall Protection page. 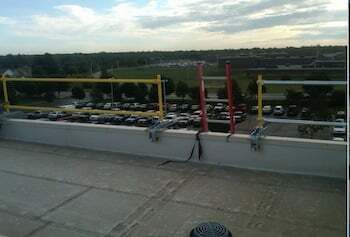 What does OSHA require of a roof edge guardrail system? Top railing that is 1/4 in. in diameter, and 42 in. (+/- 3 in.) above the working surface. It should be able to withstand a 200 lb. outward force within 2 in. of the top railing. Midrail, screen, mesh or an intermediate vertical member must be positioned directly between the top railing and working surface if there is no wall or parapet at least 21-in. high. Any rails or cable used must also be at least 1/4 in. in diameter, and capable of withstanding a 150 lb. outward force. A chain, gate or removable guardrail must be placed across any roof-access or hoisting areas when not in use. It is important to note that all projects and perimeter protection systems are different, and the components necessary to satisfy OSHA regulations may vary. For example, most guardrail systems will require base plates or clamps to secure guardrails to the roof edge, and on steep roofs with unprotected sides, toeboards must also be installed. For more information about different perimeter protection systems options, visit Hy-Tech’s perimeter protection equipment page or contact us at info@hy-techroof.com or 800-635-0384. How many guardrails and base plates do I need? How long is the perimeter of the roof I’m working on? Does the roof have a pitch? If so, what angle is it? When you know this information, you’ll be able to find a system that meets the needs of your specific job. That will guarantee the system works with your roofing membrane, covers your perimeter and attaches securely to your roof edge. Once you narrow down your system choices, you’ll be able to determine your guardrail and base plate needs. Besides a guardrail, what are my other fall protection equipment options? Fall arrest systems include safety harnesses and anchor points that are connected by shock-absorbing lanyards, lifelines and snap-hooks. All fall arrest equipment must limit the arresting force to 1,800 lbs. and allow a worker to fall no more than 6 ft.
All fall arrest equipment must be able to withstand 2 times the potential impact force of a worker’s fall. Harnesses — Body belts are not acceptable under OSHA requirements. It is recommended that workers wear harnesses that strap over their shoulders and around their legs. Dee-Rings and Snap Hooks — Must have a minimum tensile strength of 5,000 lbs. and be proof-tested to a minimum tensile load of 3,600 lbs. Lanyards and Vertical Lifelines — Must have a minimum breaking strength of 5,000 lbs. Ropes and straps must be made from synthetic fibers. Anchorage Points — An anchorage point must be an object that does not move upon fall arrest and supports a minimum of 5,000 lbs. per person attached. Safety net systems are installed on the building’s exterior, below the roof edge, to prevent workers who fall from hitting the ground. They are also subject to several important OSHA regulations. Must be installed no more than 30 ft. below the roof edge. The net’s mesh openings must not exceed 36 sq. in. or be longer than 6 in. on any side. Net must have border rope for webbing that has a minimum breaking strength of 5,000 lbs. 5 ft. or less 8 ft.
5 to 10 ft. 10 ft.
10 ft. or more 13 ft.
Keep in mind that OSHA requires all workers to be tied off while installing perimeter protection. You can find a complete list of OSHA perimeter protection guidelines here. If you have any questions about perimeter protection needs, contact Hy-Tech at info@hy-techroof.com or 800-635-0384. An in-depth look at OSHA fall-protection regulations and the roofing equipment you need to stay both safe and compliant. Download this valuable reference guide for free here.